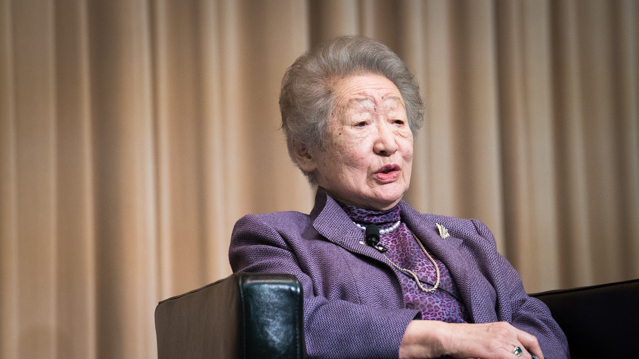 On 27 February 2015, UNU hosted “State Security to Human Security”, a Conversation Series event featuring Mrs. Sadako Ogata, former President of the Japan International Cooperation Agency and former UN High Commissioner for Refugees. UNU Rector David M. Malone and Mrs. Ogata engaged in a broad-ranging discussion covering her many years of experience as a diplomat, administrator and academic. The discussion was enriched by the long professional and personal history shared by Rector Malone and Mrs. Ogata. Throughout the event, Mrs. Ogata shared anecdotes about her formative years at the United Nations, including her early struggles to balance her personal and professional commitments. She encouraged audience member to “be ambitious, but also pragmatic” and to relish life’s challenges. Rector Malone echoed this sentiment, noting that the more ambitious one becomes, the more challenges one is likely to face. Japan’s refugee policies were a recurring theme of the conversation, and Mrs. Ogata drew on her years of experience to argue for an enhanced humanitarian intake in her home country. While she noted that legal and policy priorities required careful consideration, she also urged the Japanese government to draw experience and reassurance from their international partners in this field. Similarly, Mrs. Ogata urged audience members to forge their own personal connections with other individuals in the region, and to use these connections to strengthen Japan’s relationships with its neighbours. She argued that regional interconnectivity, through both government and personal action, was the key to a strong and prosperous Japan moving forward. Audience members asked a variety of questions throughout the evening, and many returned to the notion of human security. Mrs. Ogata’s unique contribution to the evolution of the concept — from one that focused heavily on personal safety to one that also incorporated social, environmental and economic factors — allowed her to share valuable insights into the current human security discourse. The event was enlivened by Mrs. Ogata’s candour and sense of humour. Following the event, audience members continued the conversation at a reception with light food and refreshments.